I just realized that I neglected to put this on my blog, so now the circle is complete. I must say, I love this artwork — I have a feeling Giselle Potter found a headshot of mine on the internet, which explains my long hair, but how in the world did she nail my mother’s likeness? Giselle, you are amazing. 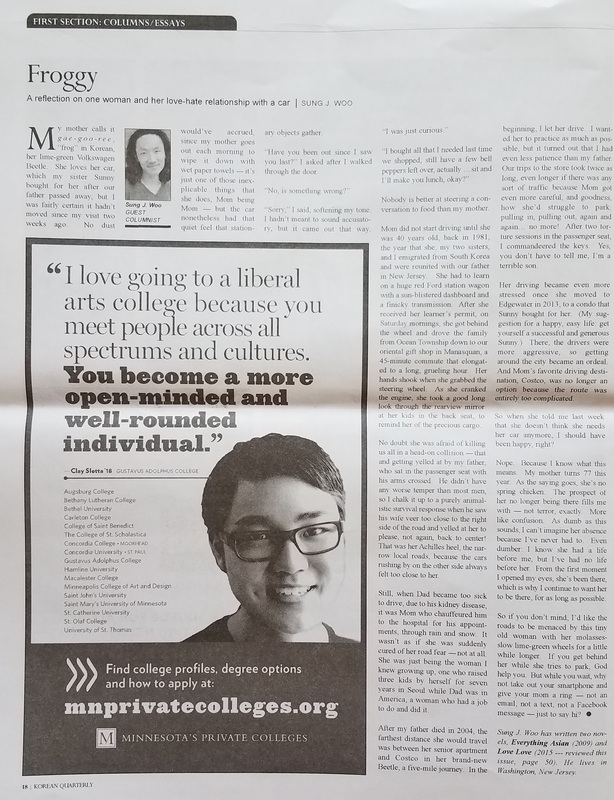 Korean Quarterly is a non-profit quarterly newspaper, written by and about the Korean American community of the Twin Cities and upper Midwest. We define this community to include first and second generation Korean Americans and their families (including non-Korean family members), adopted Koreans and their families, and bi-racial/bi-cultural Korean American people. The Korean Quarterly staff, contributors, and advisory board consist of first, 1.5 and second generation Korean Americans, adult adopted Koreans and adoptive parents of younger adopted Koreans. Even though they have a presence on the internet, they publish their quarterly on newsprint only. You know, newsprint — that thing that we wrapped fish in, crumpled to pack boxes, and also read occasionally. But since we live in modern times and since you cannot actually read my essay unless you subscribe to The Korean Quarterly, here it is, from paper to smartphone to Dropbox to my website. I suggest you click on the graphic in order to read it, since the type’s gonna be too tiny to read as is.